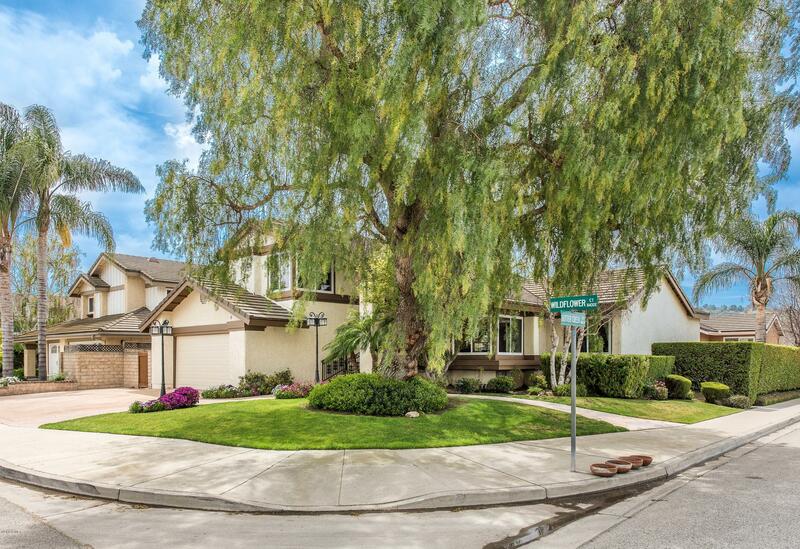 Welcome Home to this charming Buttercreek Neighborhood in South Moorpark. This stunning home has been recently updated with Granite, Stainless Steel and Recessed Lighting in the eat-in kitchen. The kitchen is open to the family room where you will enjoy entertaining friends & family with hardwood floors, a cozy fireplace & entertainer's bar. Bathrooms have been updated with new cabinetry, sinks, commodes & floors. Newer paint & high-end windows throughout. Smooth ceilings & recessed lighting inmost rooms. Large master bedroom w/ sitting area & en-suite bath. The first floor office/ bedroom has a separate entrance that opens to the gorgeous back yard. There you will find an outdoor kitchen with counter seating, Saltwater Pebble Tec cool pool, beautiful stained concrete fireplace, stamped concrete decking, covered patio & Palm Trees. RV Access possible. 2 car, direct access garage/storage area. Situated on the corner of a lovely cul-de-sac, this home is surrounded by lush landscaping.New garage door & gates.New Exterior paint on trim & eaves.Concrete Shake Roof.NO HOA!!! Award-Winning Neighborhood Schools.Easy access to the 101, 23, &118 Freeways.Close to nearby shops & parks. Welcome Home to Moorpark, known as one of the safest cities in California!